View full captions and learn more information on Flickr. With graduation around the corner, Lowell High School seniors are getting ready for senior week activities and reflecting on the past four years at LHS. Of the 153 LHS 12th graders in GEAR UP, 149 are graduating and 144 are going to college next year. Thanks to events and programming offered through GEAR UP, they’ll be ready. 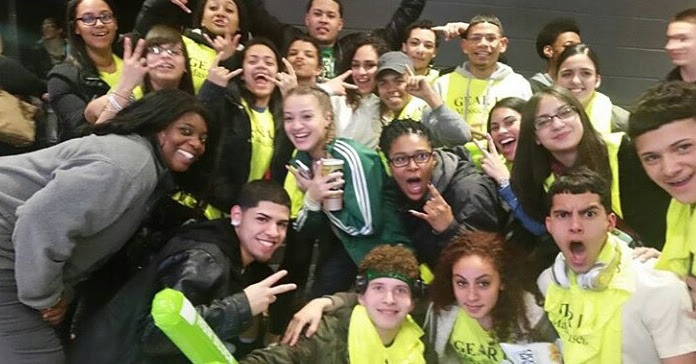 This year, students in GEAR UP took field trips to tour colleges across the state, attended college readiness events, networked with current college students and participated in a series of career readiness workshops through a partnership with TRiO and Middlesex Community College. Many students also took part in a service learning project with the University of Massachusetts Lowell, which paired them with a mentor who was a current college student and could help them navigate the college application process. Rifat Islam, a Lowell High School junior, said he’d thought of going to college online, but his conversations with UMass Lowell students changed his mind. Now he wants to attend Middlesex Community College for two years and transfer to UMass Boston for forensic science. “College is a big chance to go around different places, meet new people and have new experiences,” he said. For more photos, visit Go Higher's Facebook page. GEAR UP held one of its last events of the school year in April, organizing a successful Go Higher! event for 800 juniors at Lawrence High School. The event included a panel of five students and an admissions fair for public colleges and universities across the state. During the auditorium program, current students from Northern Essex Community College, Fitchburg State University, Salem State University, UMass Lowell and Worcester State University spoke to the high schoolers about their experience transitioning from high school to college, and what they love about the schools they are at now. The panel was followed by a Q & A session and admissions fair in the gymnasium. At the fair, students spoke to representatives from nearly 20 public campuses and participated in hands-on STEM demonstrations. Holyoke High School's vision is to ensure that all students are provided the opportunity to acquire the knowledge and skills needed to graduate prepared to pursue higher education without remediation and/or a rewarding career and to function as responsible citizens in a diverse society. In 1999, GEAR UP joined Holyoke High School in working towards this mission. They currently serve 276 students, focusing on tutoring and support to increase the number of students taking the SAT and ACT and applying for financial aid. "I joined because I wanted to be the first person in the family to attend college," said 12th grader Joeilys Diaz. 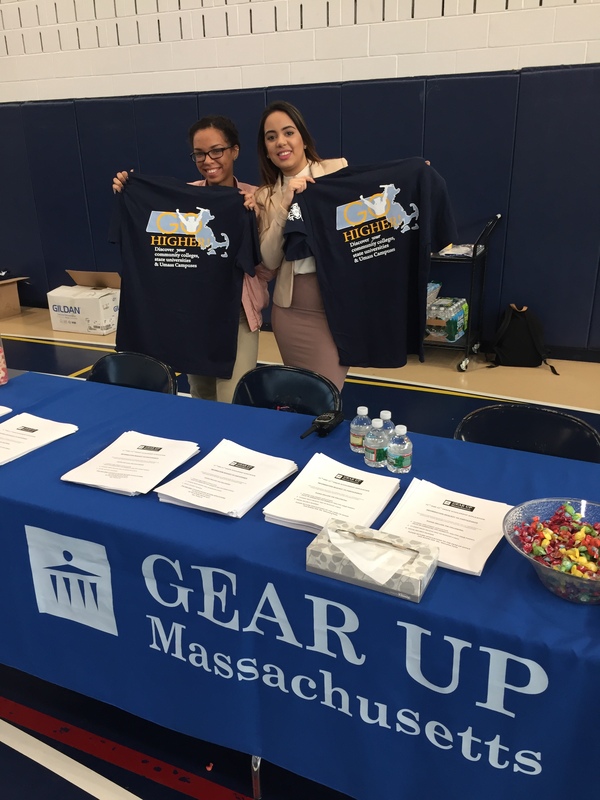 In February, the GEAR UP team worked with Holyoke Community College to host a Free Application for Federal Student Assistance (FAFSA) fill-in at the high school. Financial aid representatives spoke to parents and students about loans, grants and scholarships. After the presentation, they helped families fill out the FAFSA and answered questions as they went through the process. Umana Academy GEAR UP students visit Google in Cambridge with Girls Who Code. GEAR UP students at Mario Umana Academy in East Boston have been busy visiting high schools and colleges, and learning about different majors and careers. A special emphasis has been put on STEM (science, technology, engineering and math) programs that encourage students to consider opportunities in research, web development and more. Girls Who Code is a program that works to inspire, educate and equip girls with the computing skills to pursue 21st century opportunities. By engaging engineers, developers, executives, and entrepreneurs to teach and motivate the next generation, GEAR UP works collaboratively with volunteers to host a new model for computer science education, pairing intensive instruction in robotics, web design, and mobile development with high-touch mentorship and exposure at Umana. 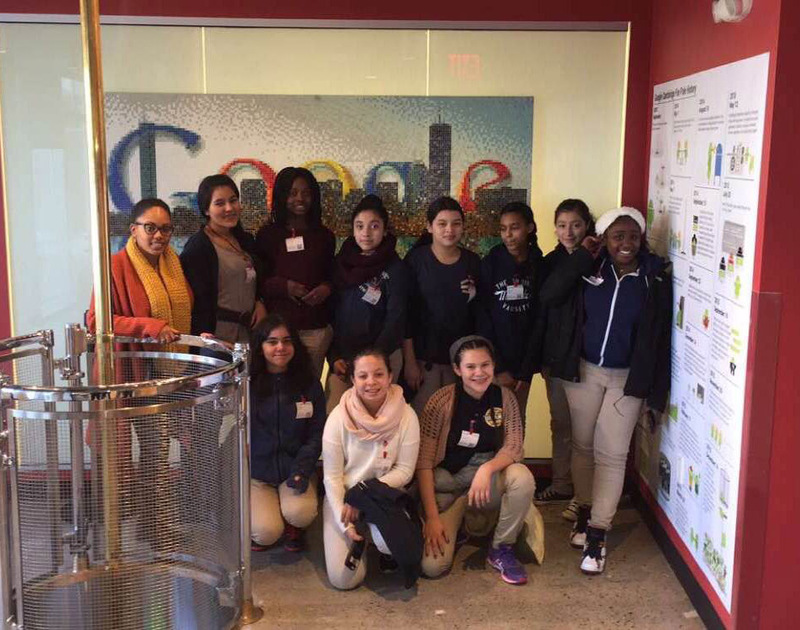 This year, the Girls Who Code After School program took a field trip to Google offices in Cambridge, MA. The girls toured the facility, getting a first-hand look into how coding can change their lives. Seventh graders were also given the opportunity to visit the KOCH Cancer Insitute and Massachusetts Insititute of Technology. Umana students met researchers who work every day to solve the cancer problem, and engaged with interactivities to learn about the science and technology of cancer research. While on site, students also toured the campus and learned about the admissions process. GEAR UP students participate in Carnival of Learning and Math Night at Normandin Middle School. With just a desk and phone in the back of the auditorium serving as their office, GEAR UP took their first cohort of seventh-graders at Normandin Middle School in 2000. Sixteen years later, they have grown significantly. GEAR UP now has a presence throughout the school, serving seventh- and eighth-grade students from their own, dedicated GEAR UP room. Like GEAR UP programs across the state and nation, they offer a variety of college and career enrichment programs. 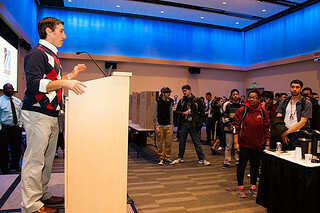 Some recent events include a math night for more than 100 students, and Carnival of Learning, an event during the day where students explore college and career options. "The carnival of learning was really fun and I learned a lot about different colleges and careers," said seventh-grader Rebecca Szela. "Thanks GEAR UP you always do such fun things!" 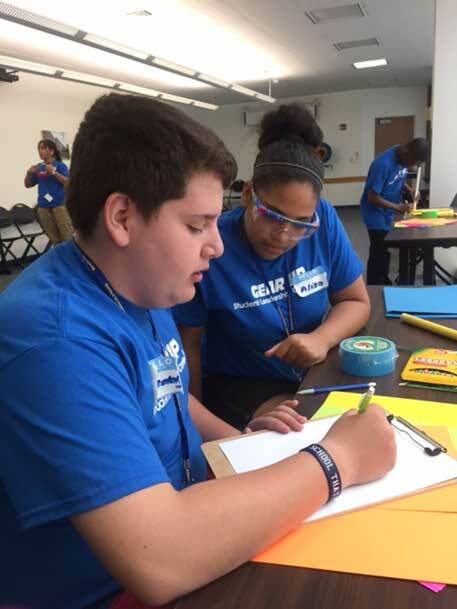 GEAR UP serves 447 students at Central High School, a "STEAAM" (Science, Technology, Engineering, Arts, Advanced Studies, and Mathematics) Magnet School in Springfield, Mass. In November, Central High GEAR UP students interested in Westfield State University were invited to attend Discover Westfield Day. They heard success stories from current and former Westfield State students, went on a campus tour and attended a fair where they learned about academics, campus life and more. The high school students talked to faculty, staff and Westfield State students about admissions standards, trying out for sports teams and getting involved in clubs. "One student commented to me how she was very excited to be the first out of all her older siblings to go off and continue her education and that GEAR UP has really helped make the process much easier," said Advisor Channing Calcasola. "It made me feel as though GEAR UP as a whole has made many doors open for many of these students through experiences they may not have been able to have without the program." North High School GEAR UP Students visit campuses across the state. Autumn is the perfect time to visit colleges; classes are in full swing, the leaves are changing, and every dining hall offers its own variation on apple pie. So far this year, North High GEAR UP students have toured Westfield State University, UMass Lowell, Fitchburg State University and Worcester Polytechnic Institute (WPI). Students went on campus tours and met with faculty from each school. They learned about unique aspects of each campus, from the Urban Education Institute at Westfield State to the robotics lab at WPI. Pyne Arts Celebrated National GEAR UP Week by displaying this video in the school's lobby. Students at Pyne Arts School in Lowell may still be in middle school, but they're already thinking about college. Over one hundred 7th and 8th grade students at Pyne Arts are involved in GEAR UP, which works to motivate and encourage them to work hard in school and pursue higher education. GEAR UP gets students excited about learning through events at school and field trips to State and Private Universities and Colleges. Students are also provided with science based field trips involving hands-on learning. Pyne Arts celebrated National GEAR UP week with a video displayed in the school's lobby for all students and visitors to enjoy. Included in the video is the field trip to Merrimack College, Oceans of Discovery in Gloucester, "Night with the Celtics" and WPI's "Touch Tomorrow" STEM festival. Photos of the outstanding Lowell GEAR UP summer program and additional GEAR UP events around the state were also included. Seven 8th grade students from SPARK Academy participated in this year's Student Leadership Conference (SLC), an annual GEAR UP summer event. 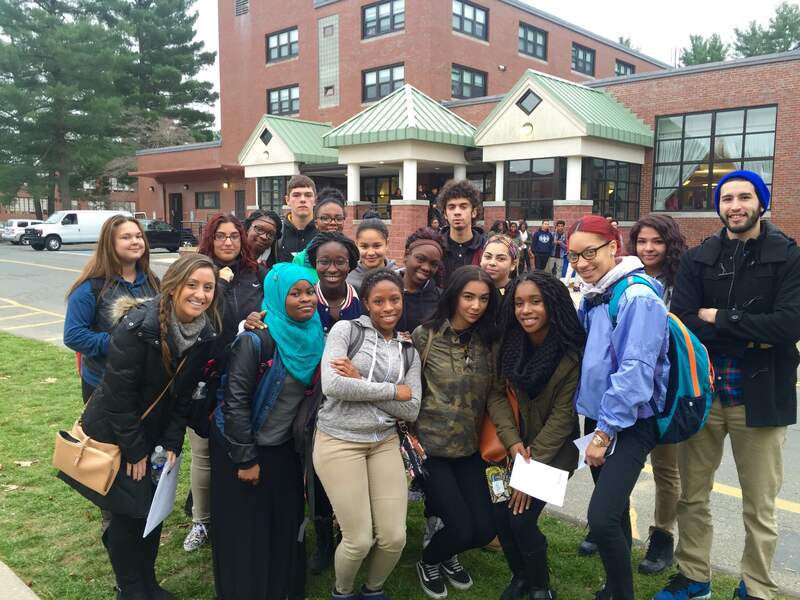 Almost 50 students attended the 3-day, 2-night event, staying in the new dorms at Worcester State University. They attended STEM-focused workshops during the day and field trips at night, while getting the feel of a real college campus and meeting other GEAR UP students from across the state. SLC workshops included solar cars, CSI, rockets and financial literacy. Alisa Colon, Tommy Hoang, Sheila Soler, Freddy Monroy, Patrick Hurley, Jaiymee Wilson and Ashley Gutierrez all participated in the event. Come back soon for more GEAR UP program highlights. If you would like to submit information about your GEAR UP program to be featured on our website, click here.